Having recently acquired a Kindle e-book reader I immediately investigated less obvious ways of using it than just reading books. Amazon themselves offer magazines, newspapers and blogs as well as normal books, however blogs particularly seem like something I shouldn’t need to pay for (especially considering I don’t have the 3G Kindle so won’t be making use of the included Whispernet fee). Of course there are a number of 3rd party services for Kindle out there, calibre is an e-book manager that will also download many popular news/magazines and send them directly to your Kindle. There is also kindlefeeder.com which will send aggregated RSS feeds to your Kindle. 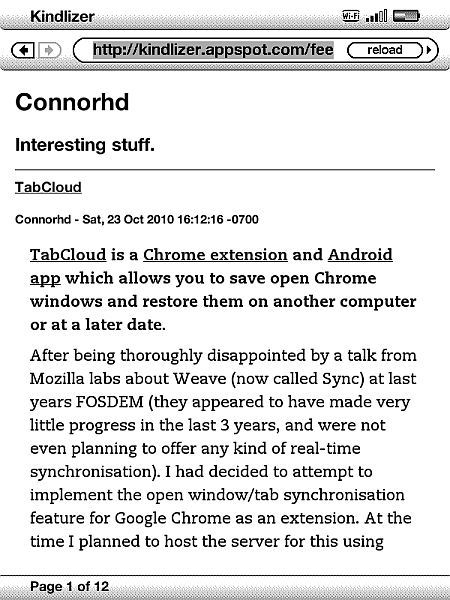 Other more generic services such as Instapaper also have some form of Kindle support (Instapaper will send unread saved pages as a digest to your Kindle on a regular basis). 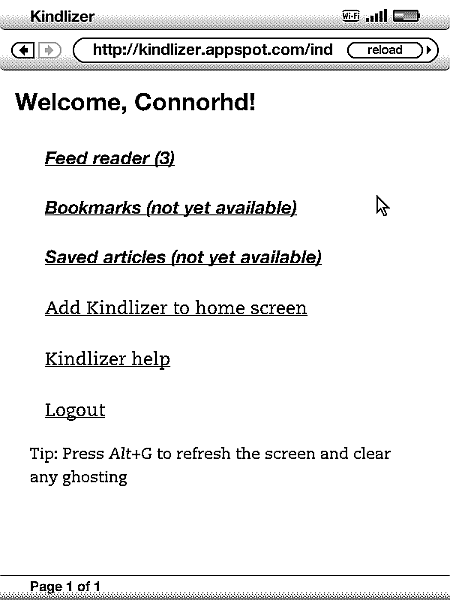 Kindlizer is slightly different to all of these services as it attempts to create an interface to be used directly on the Kindle, rather than sending static files to the Kindle to be read later. Amazon have announced a development kit for the Kindle called the KDK to allow development of applications which run on the Kindle, however it is currently in a closed beta and appears to be quite restrictive in terms of free data usage. This means Kindlizer is restricted to the experimental web browser built into the Kindle. The Kindle web browser is Webkit based which means it has excellent support for web standards, unfortunately in order for the browser to display all kinds of websites it has a less intuitive interface. The directional pad on the Kindle controls a mouse pointer which jumps around in a grid on the screen and snaps to clickable elements (why spacial navigation wasn’t used I have no idea), as well as this the page back and forward keys on the Kindle become page up/page down in the browser, meaning on each press the page is only scrolled a small portion. On top of this many pages are far too large to fit on the Kindle screen and are first shown zoomed out, requiring the user to first select a region to zoom in on. You can visit the (as of writing unfinished) Kindlizer site on Google App Engine here, alternatively there is a demo which shows this blog’s RSS feed and does not require login here. Neither of which work particularly well on any device other than a Kindle (they may kind of work on your browser, but you won’t be able to change page). The full source code for the App Engine site is open source and available here.